Don’t let Rubens current situation at Williams right now fool you – this man is both seriously fast and very, very experienced. Bursting onto the scene in the early ’90s for Jordan, he quickly proved he could cut it with the big boys, running as high as second at Donington in 1993 before the car broke down. As he star grew, he was lucky not to suffer serious injury in a scary crash the Friday of Imola, 1994. He recovered to become a fan favourite for the Irish team, Stewart, Ferrari, Honda, Brawn and currently Williams. Although Brazil next weekend may be his last race – and we sincerely home it isn’t – over a third of all races contested for the F1 World Championship have had Rubens Barrichello racing in them. That’s bonkers. We hope he does get that 20th season in F1 next year, as the F1 circus would be better off with that cheeky grin of his! It’s now hard to believe Felipe Massa was within touching distance of a world championship. The Brazilian cuts a somewhat sorry figure, worn down by the pain of losing the title on his home turf, his terrible accident at Hungary ’09 and the force of nature that is his team-mate Fernando Alonso. But we shouldn’t forget that, on his day, Felipe is a very fast driver. He can be supreme over a single lap, and it’s for this reason at all but one of his 11 race wins have come from the front row of the grid. Once there he’s able to scamper off at the front and control a race; the problem is that when he’s a little further back he doesn’t have what it takes to get to the front. Still, this is a man who totally out drove Kimi Raikkonen in 2008 and over the first half of 2009. His only chance at a title almost certainly disappeared when Timo Glock ran wide at Interlagos three years ago, but Felipe still ranks among Brazil’s finest F1 exports. There’s always an air of controversy when Nelson Piquet is discussed in the Sett, whether it be Brabham’s dubious tactics to win, his son’s controversial work at Renault, and the fact that he insulted Nigel Mansell’s wife. That, sir, was a big no-no. His time at Brabham was very successful, leading the team to two World Titles in 1981 and 1983, with the years in between leading to pole positions, but faulty machinery robbing him of wins. Knowing that Brabham was in decline – thanks to owner Bernie selling up – he negotiated a drive at Williams for 1986. That’s where the fun began. Taking potshots at Mr. and Mrs. Mansell was the start, but he also make the quip that Ayrton Senna “didn’t like girls”. This was all done at the same time as he got the Williams team on his side – culminating in another World Title in 1987. The crafty Piquet then followed Honda engines to Lotus for 1988, but it proved a bad decision as the British team was faltering. No wins, no podiums, and a final hurrah at Benetton from 1990-91 would be the last we saw of one of the sports great politicians. Just don’t mention his son. Following a rapid rise through the junior ranks Emerson Fittipaldi got his F1 break in 1970 driving a partial schedule for the mighty Lotus. He won his fourth race in America and following the death of star driver Jochen Rindt late in the season became de-facto team leader. There were no more wins in ’71 but the following year he cleaned up, scoring five wins from 12 rounds to take his maiden title with ease. After finishing runner-up to Jackie Stewart in ’73 he switched to McLaren for 1974 and duly took their first ever drivers’ title whilst also helping them to the constructors’ crown. The following year he was championship runner-up again. This is all going very well, isn’t it? Then came the inevitable disaster. In 1976 he joined the tail-end team set up by his brother, Wilson, and duly proceeded to waste some of the best years of his career in cars not deserving of his talents. He would take just two more career podiums (he scored 33 in his first six years) over the next five seasons. 1978 looked like a breakthrough, with Emmo taking 17 points to end the year tenth, but two more miserable years led him to turn his back on F1. He subsequently rebuilt his career in America, winning the IndyCar (then known as CART) title in 1989 and the Indy 500 in ’89 and 1993. Still, he managed to alienate a large chunk of American fans by breaking the long-standing Indy celebration of drinking a bottle of milk after winning the 500. Fittipaldi drank orange juice instead, supposedly to promote his own orange groves, and was never forgiven by many for his lack of respect for this cherished tradition. Top driver, prone to the odd poor decision. That’s old Emmo. The word “legend” is bandied around a bit too much for Badger’s liking these days, but if we were to use one word to describe Ayrton Senna da Silva, that’s what it would be. 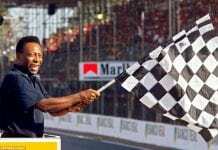 If you’re a die hard F1 fan, Senna is your idol. If you watch motorsport in passing then you’d know the name well, and if you are a keen cinema-goer then chances are you now know of the great man after this year’s incredible documentary “Senna”. Many words have been written about Ayrton since that fateful day at Imola in 1994. All we at Badger know is that 3 titles, 65 poles, 41 wins in a 10 year career are just numbers. Senna wasn’t just the greatest Brazilian driver, he was arguably the greatest ever. There have been a total of 30 Brazilian Grand Prix drivers, with Chico Landi becoming the first when he qualified for the 1951 Italian Grand Prix and Bruno Senna the most recent addition following his debut in 2010. As well as those listed above (that is to say the great) there have been plenty of less than stellar F1 entrants from the South American nation. Case in point: Ricardo Rosset, who stands out as one of the worst F1 competitors of the 1990s, a driver so bad he was able to make Tora Takagi look half decent. Then there’s Luciano Burti, who only ever got TV time when he was having massive shunts; oh, and the less said about Nelson Piquet Jr. the better. Going back a bit further we have Chico Serra, who failed to qualify for 15 of the 33 races he entered between 1981 and ’83, and Alex Ribeiro, who made only ten of the 20 he attempted. And Antonio Pizzonia was no whiz: ‘Jungle Boy’, as he was known, once rolled a roadcar at Silverstone with a journalist sat in the passenger seat after he tried to take a corner too fast. And that’s to say nothing of those who were just plain average: the likes of Pedro Diniz, Enrique Bernoldi, Christiano da Matta, Ricardo Zonta, Christian Fittipaldi, his father Wilson and the wig-wearing Roberto Moreno. For every fast driver called Senna or Piquet there’s also a distinctly average driver called… well, Senna and Piquet Jr.
13 – The Number F1 Forgot?